I remember enjoying the TV series The Tomorrow People. It gave (in the 1970s) a glimpse of a possible future where the next stage of human evolution (Homo superior) had emerged. Now, with Tomorrow’s Lawyers, Richard Susskind does that for lawyers. Although, Richard does not, as yet, envisage those lawyers having psionic powers such as telepathy, telekinesis, and teleportation like the Tomorrow People had! Richard has, of course, been telling us what the future holds for some time now with The Future of Law (1996), Transforming the Law (2000) and The End of Lawyers? (2008). His predictions have often been spot on. This latest book, as Richard acknowledges, condenses many of the thoughts that appeared in The End of Lawyers? into a more manageable form. I certainly found it an easier and quicker read. As a result the messages it contains are perhaps conveyed more forcibly. Richard sees efficiency and collaboration as two winning strategies to help cope with the more-for-less challenge facing law firms. There is no doubt that in most law firms there will be more efficient ways of doing things. Creating such efficiencies is a constant process in my own law firm (Inksters) and we still have a long way to go before we are as efficient as I know we could be. Collaboration by clients coming together to share the costs of certain types of legal services is an interesting concept. Whilst Richard gives examples of banks and in-house legal departments he thinks that this philosophy could equally extend to small businesses and individuals. We will have new look legal businesses serving communities of legal users rather than individuals or organisations on their own. On the topic of collaboration I think much could be said for more and better internal collaboration within law firms. Lawyers are notoriously bad for the lack of collaboration and cross-referrals within their own four walls. This is not what Richard means when he looks at collaboration but I think the concept can and should be widened by law firms who are serious about their future to include internal collaboration. Richard Susskind does not see much of a future (beyond 2020) for most small law firms in liberalised regimes. However, later in the book we are told that two kinds of traditional lawyer will still be in play for the foreseeable future. These will be the ‘expert trusted advisers’ (whose bespoke work cannot be standardised or computerised) and the ‘enhanced practitioners’ (who are skilled and knowledgeable rather than deeply expert but enhanced by modern techniques of standardisation and computerisation and often the legal assistant to the expert trusted adviser). Therefore presumably those small law firms who concentrate on providing legal advice in areas that require expert trusted advisers and enhanced practitioners will prosper. John Flood has written about this in The rise of Boutiques? So perhaps we should not write off the small law firms just like that. But many will have to look at what their offering consists of and possibly adapt or die. Richard tells us about the new jobs for lawyers that we will see emerge: The legal knowledge engineer, the legal technologist, the legal hybrid, the legal process analyst, the legal project manager, the ODR practitioner, the legal management consultant and the legal risk manager. Renee Knake has perhaps recently suggested a ninth: the lawyer as trusted curator. Although that role as curator could be an add on for some of Richard’s expert trusted advisers. I certainly see a role in a law firm for a legal journalist to produce content for the law firm’s websites, blogs and social media channels. Some law firms (e.g Pinsent Masons) already have employees in such dedicated roles. Concentrating on short term profitability rather than long term strategic health is a problem Richard Susskind sees in law firm management. We just need to look at recent casualties in both England and Scotland to see the reality of the situation. But will we see a shift in philosophy to senior partners regarding themselves “as temporary custodians of long term and enduring businesses rather than short-term investors who want to bail out when the price is right”. We might need to if the closure (in some cases of merger, effective closure) of law firms is to halt. In any event there is also no real opportunity anymore for many to “bail out when the price is right”. The problem of law firm partners siphoning off all the profits (in some cases, especially in the past, sums in excess of the profits as assisted by a bank’s willingness to provide excessive overdrafts) and reinvesting little if anything in the firm’s future leaves many firms unmarketable. As Richard comments elsewhere in his book “for much of the legal market, the model is not simply unsustainable; it is already broken”. Richard mentions the use of generic services such as LinkedIn or legal tools such as Legal on Ramp for collaboration between say a client and their panel of law firms. I wonder whether Yammer could be a good fit for this purpose. Online legal services will, Richard believes, “liberate the latent legal market”. I am sure that this is correct but in addition to that latent legal market online legal services can and will, I believe, fire up and provide services to the existing legal market. Lawyers can and should be using online for the benefit of (and to retain) existing clients and not just for ones that they thought they might never have had otherwise. IT enabled courts are discussed by Richard. As I recently blogged the use by the Scottish Land Court of fairly basic but effective technology is perhaps something for other courts to take a leaf out of. With regard to video conferencing in courts, all of the Scottish Sheriff Courts are fitted with such technology. At my own law firm we use Sheriff Court video conferencing when we can. However, one of the difficulties we have experienced is the reluctance of some Sheriffs to use it. ‘Irrational rejectionism’ again perhaps! It probably needs the Scottish Court Service to remove much of the discretion on the part of Sheriffs and issue guidance on when and how the technology should be deployed. Richard thinks that major legal publishers (such as Thomson Reuters) and legal know-how providers (such as the Practical Law Company) will be potential employers for tomorrow’s lawyers. It is interesting to note that since the book was written it was announced that Thomson Reuters are taking over the Practical Law Company. Thus we are already seeing law publishers becoming legal know-how providers! Richard fears that we are training young lawyers to become 20th Century lawyers and not 21st Century lawyers. No doubt about it with, perhaps, little chinks of hope such as my lecture on IT and Marketing in the Legal Profession to the Business Ethics Finance and Practice Awareness course of the Diploma in Legal Practice at Glasgow University. That was two years ago and whilst well received by the students back then (one told me it was the most memorable lecture of the year) there has been no call by the powers that be for me to repeat it. Perhaps there is ‘irrational rejectionism’ at play again with it being seen as too radical by the current course providers. I know that, in more recent times, the University of Strathclyde has introduced lectures on social media for their students and the College of Law produced video casts on that topic for their students. No doubt more is being done elsewhere but I rather think very much at the fringes. Richard Susskind considers that tomorrow’s lawyers should perhaps study “other disciplines – such as management, computing and systems analysis – prior to embarking on a legal career”. Should, I wonder, we have courses that combine such disciplines with law? One question Richard prompts tomorrow’s lawyers to ask prospective employers is “what is the formal process by which your firm monitors emerging technologies and evaluates their potential for various practice areas?” At the moment for young lawyers keen to secure a traineeship questions of this type may, unfortunately, raise a few eyebrows and possibly lead to being rebuffed by most of today’s law firms. Perhaps tread carefully with such questions unless research prior to interview shows the potential for receptiveness. Richard finishes his book by telling tomorrow’s lawyers that their “elders will tend to be cautious, protective, conservative, if not reactionary. They will resist change and will often want to hang on to their traditional ways of working, even if they are well past their sell by date.” Richard goes on to point out that “in truth” tomorrow’s lawyers are on their own. He urges them “to forge new paths for the law, our most important social institution”. The difficulty, however, for most young lawyers in that environment is the inability to do so. They may have to put up with it for a few years to get a grounding in the law and then break free on their own. 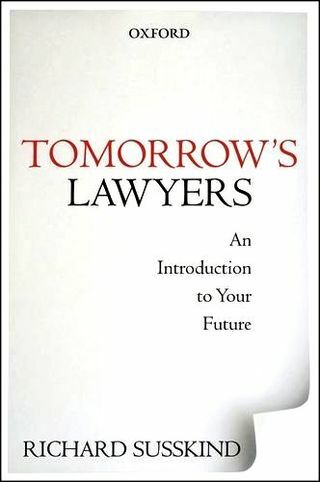 Whilst aimed at tomorrow’s lawyers (presumably the law students and trainee solicitors of today) Richard Susskind’s latest book contains messages that it may not be too late for the older generation of lawyer to grasp and, if so, perhaps could induce change within their existing law firms before it is too late. However, with ‘irrational rejectionism’ prevalent amongst lawyers perhaps that is too much to ask for! Tomorrow’s Lawyers by Richard Susskind (ISBN 978-0-19-966806-9) is published by Oxford University Press and is available online for £9.99 at Amazon UK and $14.81 at Amazon USA. Judy Dyke on 08/04/2013 at 5:55 am. Thought provoking review. I am definitely old school, but am fascinated by the challenges of change to our profession. I am enthusiastic to embrace new practices and engage with young colleagues in considering what will benefit our clients. We have signed up for PLC for all teams and are rolling out Proclaim starting in the property team. I am just aware that we must put in place careful training for all staff to utilise fully these amazing products. I will now order this Susskind book for further advice. jack cruso on 17/09/2013 at 10:24 am. This review has undoubtedly been successful in bringing the gist of “Tomorrow’s Lawyers” in front of the readers. Yes, changes can be easily observed, like the increasing influence of technology on law as It was not that long ago that many law firms could be heard wondering whether to adopt technology to their practices. They no longer have that option. Competition forces their hands. It is not so much that technology has imposed itself on lawyers, as those changes in the demands of law practice have required new solutions. Certainly, the future holds key to many of our unlocked questions.